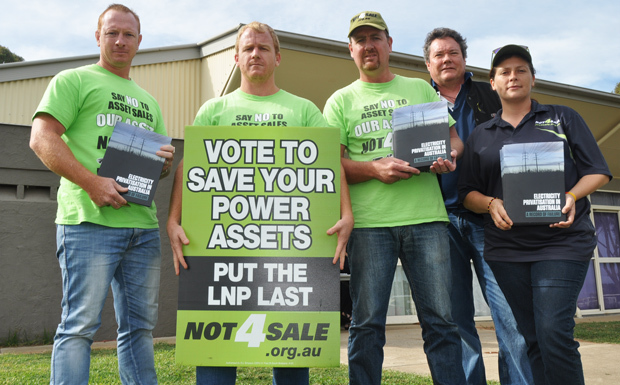 Unions linked to the power industry have greeted today’s State Budget with anger and dismay saying privatisation of assets such as the Tarong power stations will mean fewer jobs in regional Queensland. The Services Union, which represents members at Stanwell Corporation and Ergon Energy, said the State Government’s privatisation plans would mean more job losses and less job security for Queenslanders. Secretary Neil Henderson said the privatisation plans were short-sighted. “Privatising revenue-generating assets is nonsensical,” Mr Henderson said. “We’ve recently seen real consequences of privatisation with over 400 job losses at Aurizon, which the Premier himself admitted is part and parcel of the process. “Privatisation of the Port of Brisbane under the previous State Government led to 45 per cent of that workforce losing their jobs. “If governments continue to privatise Queensland assets, we will see more job losses across the State, which will have real consequences for our communities. “These assets generate revenue for Queensland and should remain in public hands to finance infrastructure and deliver services for our children and the future of Queensland. The Electrical Trades Union says it is a “dark day for the electricity industry”. 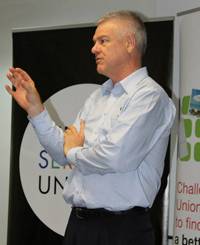 ETU state organiser Stuart Traill said the Budget was “built on lies from an incompetent, lazy and arrogant government devoid of ideas with the impact hardest on regional areas and seniors”. “The government expects Queenslanders to believe they can’t fund education, health, natural disaster relief and other essential services without selling off our profitable assets. Well here’s a question, what do us as Queenslanders pay taxes for? “We have a Treasurer who said he would listen to the people of Queensland. “This Budget shows his ears have been closed and his agenda drawn up by the big end of town. “This Budget and its lazy asset sales agenda will see private companies controlling 49 per cent of Queensland’s electricity distribution poles and wires network. “The wholesale privatisation of generators CS and Stanwell will put the State’s public electricity industry at risk, leaving many thousands of workers and regional towns facing uncertain economic futures. “Power station workers and those employed to build and maintain the network will stop spending money because they know job cuts follow privatisation as sure as night follows day. “Our question to the LNP is: How is job insecurity and unemployment going to help regional economies? “The Budget, despite all the service and job cuts and higher prices, has blown out by a staggering $1.6 billion. “This is their responsibility. They said they would fix it, they have failed. The Budget is in deficit and growing, jobs are going faster than Nicholls’ excuses and cost of living is skyrocketing, highlighted by the massive 36 per cent increase in power prices since last July. How Would You Raise $80 Billion? Sorry Marc Peters you must be one of the negative people Mrs Frecklington talks about or maybe one of those union radicals. No normal person could care less about privatisation or so we are lead to believe.